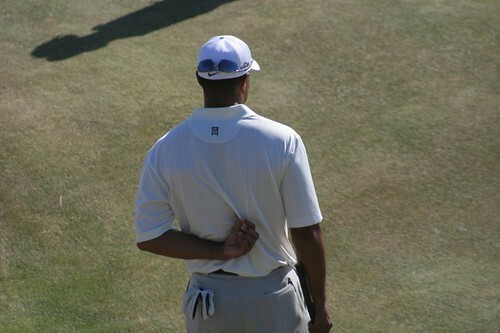 Richard Carter -- Tiger Woods at the 2006 Open, Royal Liverpool, Hoylake, UK. Both the #WorldCup and the #USOpen merited their own hashtags on Twitter in the past few days, but whereas one trended wildly and loudly, one hugely popular event with celebrity starpower stayed relatively quiet — at least within my view of the social web. I’m delighted my father took me with him on Saturday to watch in-person the US Open in Pebble Beach. I was born not miles from this truly gorgeous spot, and though I’ve not exactly been a fan of the sport, I love my dad and was honored to spend father’s day weekend with him, and so close to where I was brought into the world. But that spot, while beautiful, is exclusive. You can’t get to the area without paying admission to the 17 Mile Drive, and I’m not even sure if you can get on the golf course without paying admission. Lodging anywhere nearby was up to 4x its usual rate. Not coincidentally, we were asked to shed our cell phones – indeed, any connection to technology – before we entered the venerable Pebble Beach grounds. I think I can understand the need to concentrate while swinging in a relatively quiet individual sport, but I can’t help but think that the exclusivity of the spot, the spectators, the lodgings, and the culture coupled with the mainstream-only nature of the reporting and lack of explosion on the social web not only lead to collective social silence but perchance the eventual sunset-over-the-pacific of the sport itself. Contrast the relative radio silence on Twitter and the social web of the US Open, which closed yesterday with Northern Ireland on top no doubt thanks to our family’s Northern Irish influence, versus the noisy exhuberance of the World Cup. 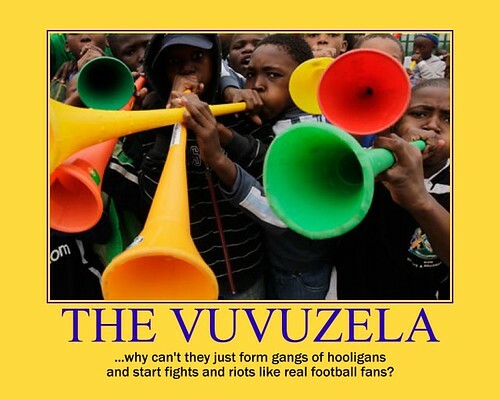 Not only did the event itself trend, but the countries, the goals, the people and the noisemaker itself — the famed vuvuzela — have taken over Twitter trending for days. I know this is a world-wide event (as much as we think there’s only one kind of “football” in the United States), wheras golf is rather provincial in nature — cause or an effect? I could also ask myself whether the huge lucrative US Open event would really care to be a worldwide Twitter trending topic. I appreciate the gorgeous isolation of a rocky inaccessible beach as much as the next, but as a person existing in the world and more and more thanks to the social web, I feel it’s my duty, right, and necessity to share this world and the things I enjoy on it, and this is part of how I appreciate Twitter. And yet even I’m not beyond wondering if all this noise is always a good thing. The real irony may be that collective access destroys and we can thank exclusive sporting events and multibillionaire mansions for keeping our coastlines pristine (no thanks to their — everyone’s — oil dependency) and maybe, just maybe, a little exclusion is not a bad thing in the right places. Though I’m hardpressed to think of many things these days not changed by the noisy social web, golf, Pebble Beach, and its people appear to be exactly that, and were certainly largely missing from the Twittersphere over the weekend. The man holds up the baton, says “hold please,” and the huge crowd is quiet, for the swing and beyond. Even the drunk medics are strangely obedient. In the end, perhaps some sports join other battles of the more personal nature and are better played out on the private landscape.